Want to connect with Kyrylo? 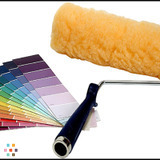 Painting, plastering, drywall installation, taping, spraying, wood staining. Exterior/enterior; commercial/residential. Clean, punctual, friendly, high quality level. Company is fully licensed. All papers and references available upon request. Experienced working with big projects Calgary with 200 units and around 40000 sq.f commercial parking lot finished in short terms. Hello I'm Victor I live in vancouver I'm a guy very hardworking and responsible, I offer an excellent service painting. Excellent Painter with 30+ years of experience.